That is it from Holyrood Live on Thursday 10 January 2019. Scotland's first minister has denied conspiring against or colluding with Alex Salmond over the sexual harassment allegations against him. Nicola Sturgeon was speaking after Mr Salmond claimed some people wanted to "remove me as a political threat". 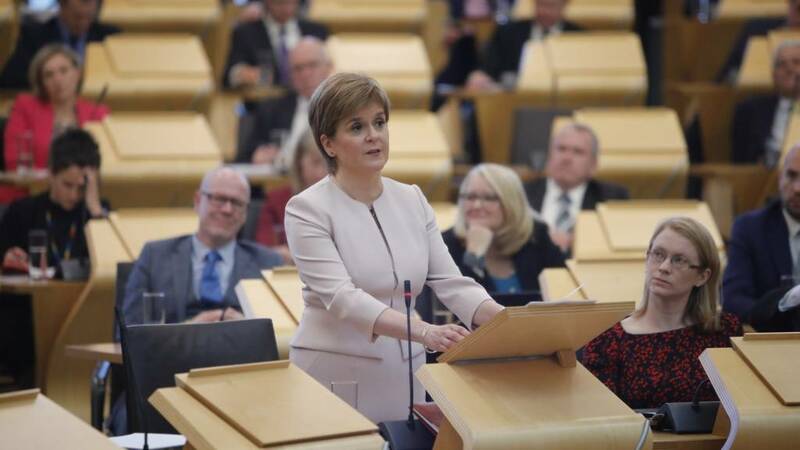 Facing further questions from opposition leaders during FMQs, Ms Sturgeon repeatedly insisted that she did not attempt to intervene in the investigation process after being told about it by Mr Salmond at her home in Glasgow on 2 April. Ms Sturgeon revealed that the Scottish government's chief of staff, Liz Lloyd, had been present during that meeting and that Mr Salmond was also represented - which has led opposition parties to question why it was not treated as a Scottish government meeting and minuted. All three opposition amendments are defeated. The Scottish government motion is agreed with 83 votes for, 27 votes against and 6 abstentions. Food standards must be protected after the UK leaves the EU, the farming industry has said. The National Farmers Union said it had heard enough "warm words" from ministers and action was needed now. Its president, Minette Batters, said any attempt to encourage cheap imports after Brexit in an effort to cut food bills should be "fought to the death". Environment Secretary Michael Gove said standards should not be "bartered away" in pursuit of short-term trade gains. A lack of action in key areas of climate policy is being masked by good progress in decarbonising the power sector. Those are the findings of a report sent to Scottish ministers. The Committee on Climate Change said action was needed to speed-up progress in areas like agriculture. The report primarily looked at progress against existing targets and concluded that good progress in the power sector is masking a lack of action in other areas, particularly agriculture. Hundreds of delegates from across rural Scotland converged on Stranraer to discuss issues affecting their areas in November. The impact of Brexit and helping communities to "take action" were the key themes of the event. The Scottish Rural Parliament is held every two years. Emma Cooper, chief executive of Scottish Rural Action who organise the event, said it was an important time to speak with "one, powerful voice". "Every community in Scotland will be affected by Brexit, with rural areas particularly exposed, so it's important that Scotland's rural communities organise and take action to prepare for the changes ahead," she said. Farmers and food producers face "considerable turbulence" if the UK leaves the EU with no deal, Environment Secretary Michael Gove has said. He told the Oxford Farming Conference it was a "grim and inescapable fact" there would be tariffs on exports and new sanitary and other border checks. While "not perfect", he said Theresa May's Brexit deal would protect market access and provide economic certainty. But Labour said "basic legislation" was not in place to prepare for Brexit. The UK government is to set up an independent review into how farm funding should be distributed around the United Kingdom after Brexit. An independent advisory panel will look at subsidies going to England, Scotland, Wales and Northern Ireland to ensure they are "fairly split". NFU Scotland has said it was "bitterly disappointing" that it would not address previous funding decisions. The Scottish government said farmers should receive the £160m they are due. The independent National Council of Rural Advisers published its final report last September, setting out six recommendations for the Scottish government. The UK Agriculture Bill is a "missed opportunity" which "rides roughshod over the devolved settlement" the Scottish government has said. The Bill was introduced at Westminster in September. UK Environment Secretary Michael Gove said it would deliver a "green Brexit" and a "smooth and gradual transition". But Scottish Rural Economy Secretary Fergus Ewing said the bill does not deliver on promises made to farmers. Lib Dem MSP Mike Rumbles welcomes the creation of the taskforce which will encompass producer, consumer and environmental organisations to develop a new system for farming and food production. While he says he regrets that Brexit is happening, Mr Rumbles says party politics must be set aside to ensure a new bespoke system is beneficial to rural communities. He also says a common UK framework must be agreed by both parliaments to ensure appropriate operation. The Lib Dem MSP urges colleagues not to put up "false barriers". Green MSP Mark Ruskell insists it is important for the agriculture sector to reach net-zero emissions. Current emissions accounts puts agriculture in one silo and land management in another, he says, which he argues must be changed. Mr Ruskell says it is time to begin financially rewarding farmers for environmental measures as voluntary schemes will not go far enough. He suggests Common Agriculture Policy reforms will likely put the Paris Agreement at its core and calls for any future Scottish scheme to do the same. Labour MSP Rhoda Grant says the Scottish government motion lacks ambition for farming and crofting communities. "We need to grasp this opportunity. Now more than ever we need to grow these rural communities," she says. She insists that public money should be used prudently to ensure those farms which provide public benefits are paid at least the agricultural minimum wage. She also suggests a right to food should be included in the key principles for the food sector. Ms Grant also says the parliament must work to replace EU funding which goes to rural communities, such as LEADER funding. Tory MSP Donald Cameron insists the options for Brexit are the prime minister's deal or no deal. The opportunity to design a new system of bespoke support for farmers and crofters is a benefit of leaving the EU, he says. He says there must be a definitive Scottish support system which responds to the needs of farmers here. The Tory MSP suggests the cabinet secretary's comments today on LFASS are a "screeching U-turn" as it was reported previously that payments might fall to 40% of the current level. "We agree that the new farmer support system must be simpler but we are sceptical of the Scottish government's plan to create another taskforce," Mr Cameron tells the chamber. He says farming must be made more flexible so people are able to pursue other options, thus making it more attracting to new entrants. This government sees a continuing role for direct support for farmers and crofters, Mr Ewing states. But he tells the chamber he believes the UK government is at risk of having over-promised and under-delivered. He expresses hope that the review of convergence funds will ensure Scottish farmers receive the monies they are owed. Regarding the Less Favoured Areas Support Scheme (LFASS), the cabinet secretary says transitioning out of this will be difficult but he commits to ensure funding for 2019-20 will not fall below 90% of current support. Mr Ewing insists it is this parliament's job to provide legislation for Scotland's rural needs and should not be done under a schedule of the UK's Agriculture Bill. However, he is unable to give a precise date on a Scottish Agriculture Bill. Rural Economy Secretary Fergus Ewing begins by stating that none of the Brexit options are good for Scotland's rural economy and they will all negatively impact farming, fishing and forestry. We have consulted on a plan for how to transition away from the Common Agricultural Policy he says, and adds that the majority broadly supported the Scottish government's proposals. He confirms that opportunities to streamline current schemes have been identified and the agri-policy taskforce will review forestry grant applications next. Mr Ewing says sustainability, simplicity and innovation will be the core objectives going forward, but perhaps most importantly sectors must be profitable and help communities in which they are based. MSPs will spend the rest of the afternoon debating the future of rural policy and support.